Ah yes, the subtleties of poster design. Our friends at Cinematical have the official debut of the poster for Crossing Over, the illegal immigrants movie starring Ashley Judd, Harrison Ford, Ray Liotta, and Jim Sturgess. The only impressive part of this poster is Ford's very pissed off stare, but other than that, there's not much to appreciate in this. Even the cheesy hidden American flag design isn't that exciting, especially because throwing that onto a poster isn't going to help sell it that well anymore. But then again, maybe I'm not the right audience for this, so who cares what I have to say? Either way, check it out below. If you haven't already seen it, we previously debuted the trailer for Crossing Over in November last year. 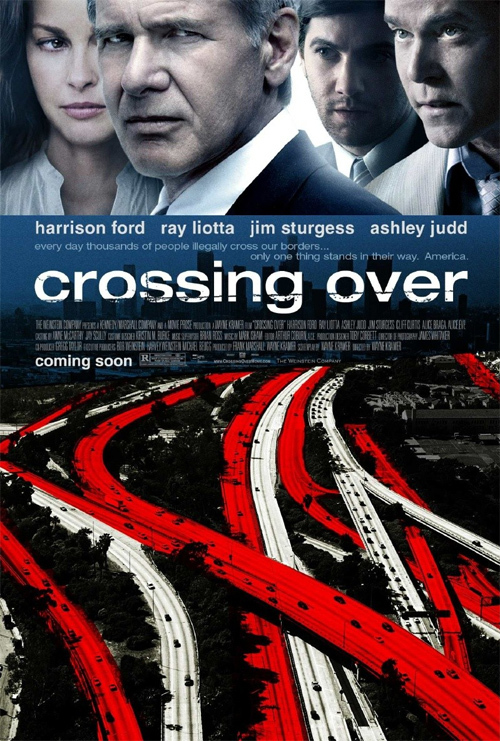 Crossing Over is written and directed by South African filmmaker Wayne Kramer, of both The Cooler and Running Scared previously, who is a naturalized US citizen himself. The film features an impressive ensemble cast, including Sean Penn, Ray Liotta, Ashley Judd, Alice Eve, Alice Braga, and Jim Sturgess. The Weinstein Company will debut Crossing Over in theaters everywhere on February 27th. SUPERB poster. I love the tagline as well. Glad to see Ford and Liotta are back! I am not quite sure what you are talking about Alex. I find this poster well executed for the average design. ugh........ashlely judd is in it? a veritable "kiss of death". all her movies are horrible. I gotta say...I really like this poster, it's perfect for the point they're trying to get across. This is arguably one of the worst posters I've seen in a long time. It's too busy, the colors clash (i.e., nothing balances the red) and it tells you nothing about the film. And if it's trying to be symbolic, it's mistakenly referring to the literal title of the film rather than the actual plot (immigration, etc.). For a film I've actually been looking forward to (as I was frankly surprised by and readily enjoyed Kramer's Running Scared), this is a terrible marketing scheme. Harrison Ford standing by himself would've been enough for me. The lower part looks just horribly tacky. This is something I could've put together in a coupe hours and I'm far from being a pro. you know, it looks like the original poster was only the bottom part and someone jumped and said "wait, let's include the actors on it! ", so the designer was then forced to add the top photos. Cover the upper part and you will see that it stands on itself much better than with the photograph on top. The typography is awful, although Helvetica could be fine since it's so widely used (for example, American Airlines) it looks distorted, vertically compressed. I would've gone with something much more modern (and actually american), like Whitney or Verlag from Hoefler & Frere-Jones. Seeing it again, I can definitely see some good artwork destroyed by marketers. The original poster may have only the flag, the headlines on top, the credit text on bottom with the highway faded to black. It could have meant to someone that it was going from one dark situation to another and then the tagline would have been stronger. I was thinking more Canadian flag design then American. No blue in there =P And I have agree with #10. Looks like good artwork mangled by a suit.